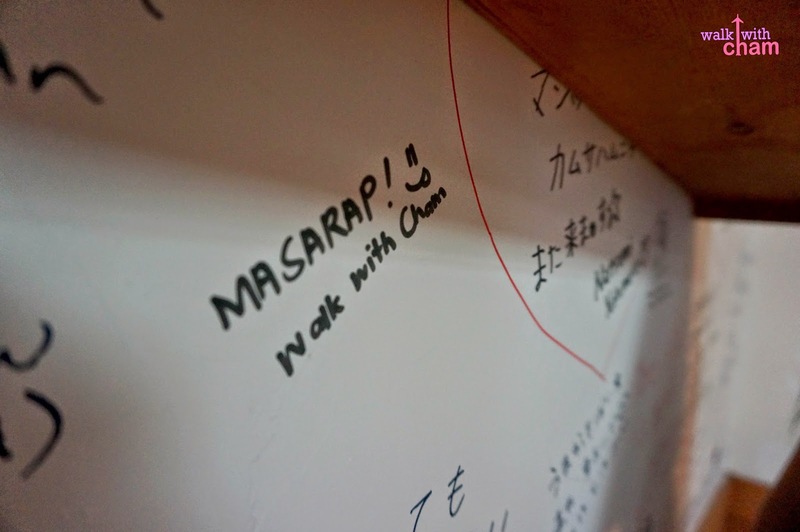 I can still remember clearly my first Korean cuisine encounter. 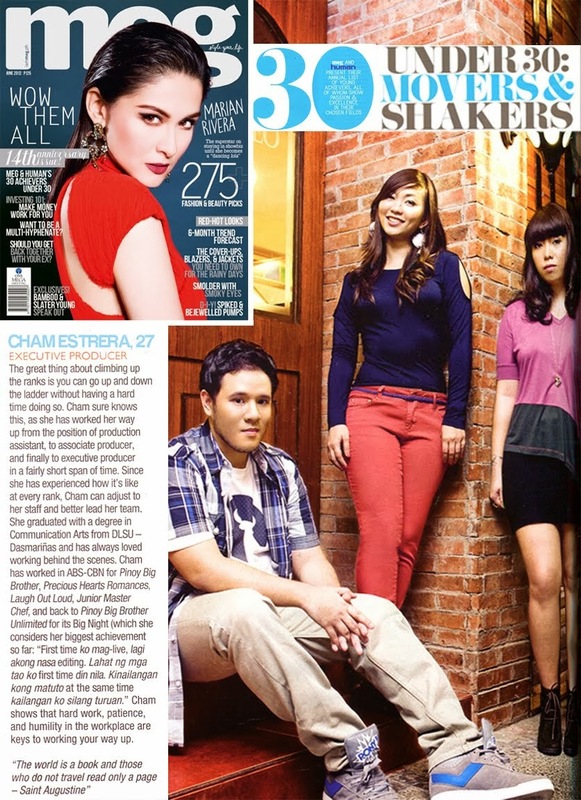 It was the year 2009 during Ellie's Birthday (my bestie). She became a fan of the cuisine when she started working and eagerly introduced it to me. Because it was her birthday and I've never been the type who's choosy with food so I gave it a shot. 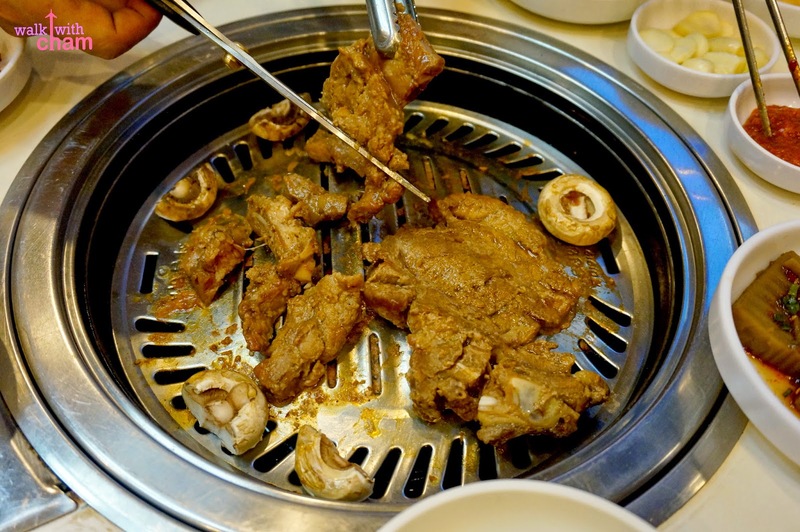 We ate at a Korean Barbecue Restaurant in El Pueblo and it was definitely a night to remember. So once in a while I eat at a Korean restaurant whenever I crave for it. Korean Cuisine is nothing new to me, it started to become popular in the Philippines when Koreans invaded our country (na kahit saan ka pumunta puro Koreano) so as the Koreans grew in numbers so did their food in the Philippines. 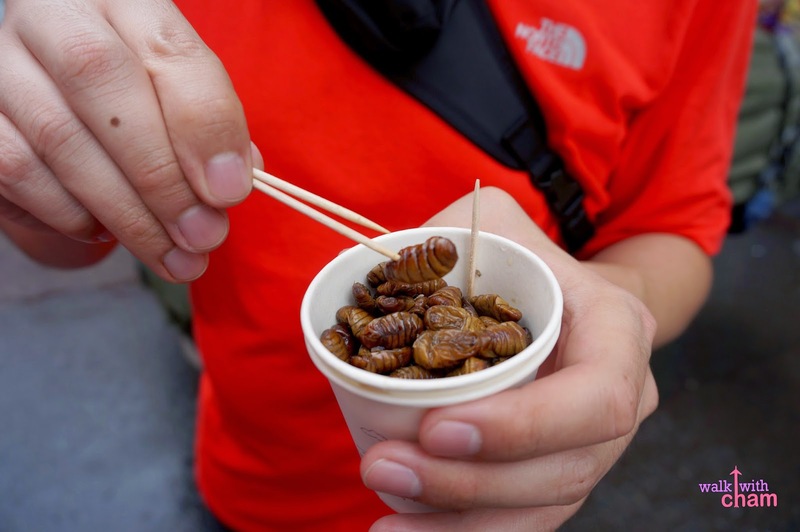 Eating was one of the things I looked forward to when I went to Seoul. 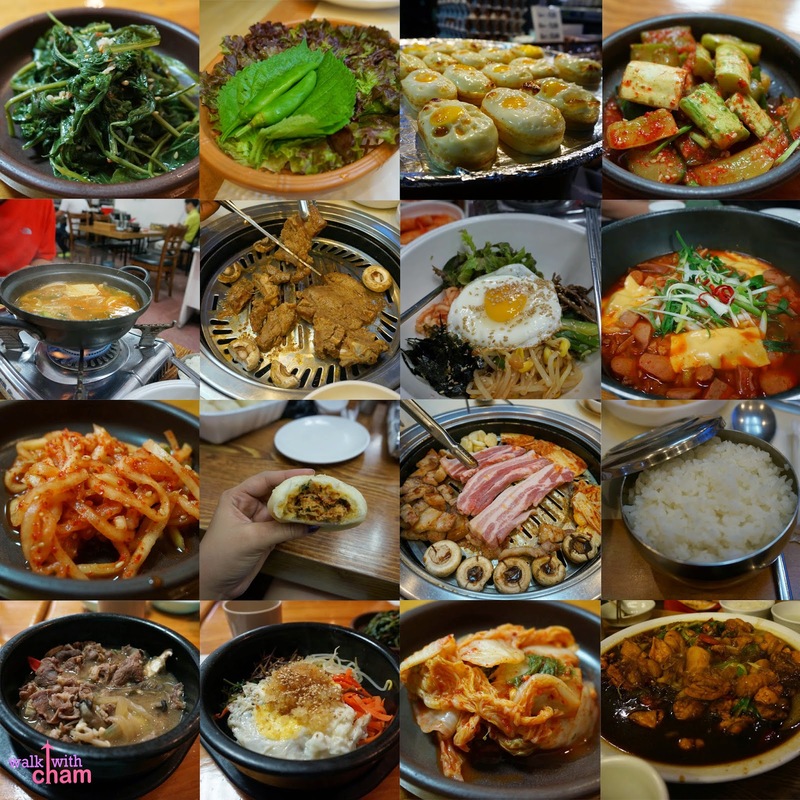 So I compiled all the Korean dishes I liked [and didn't like] during my stay. 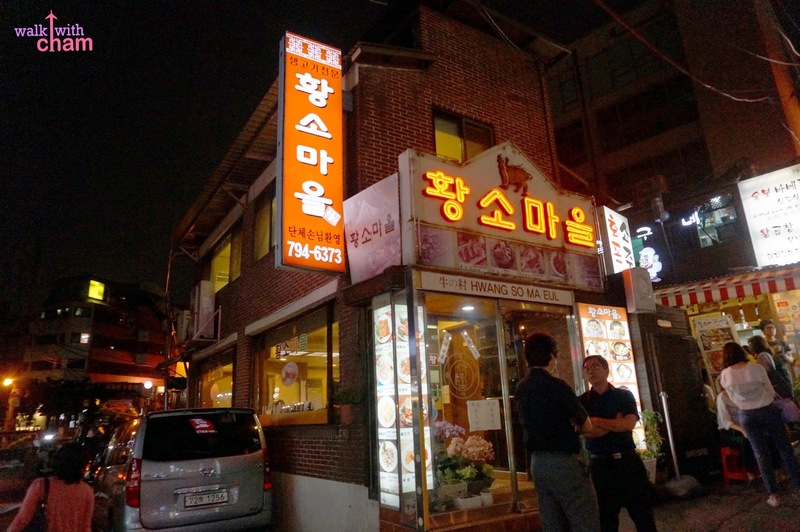 Along the busy alley of Itaewon lies an authentic traditional Korean Barbecue Restaurant that serves popular Korean dishes cooked on a grill at the diner's table. 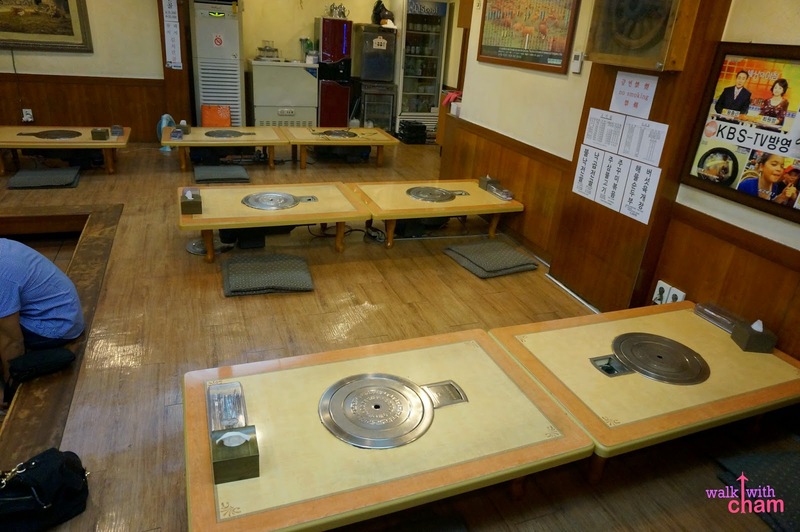 It is so traditional that the guests are required to take off their shoes and sit on the floor like what Koreans do when they eat. 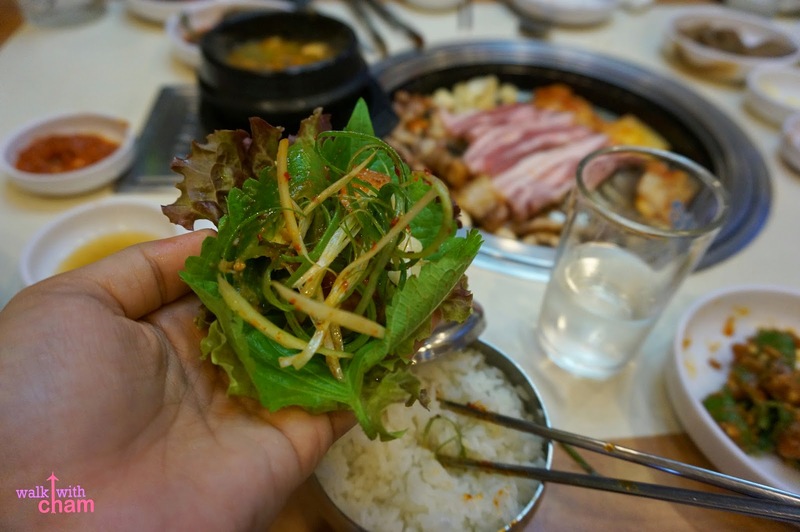 Our meal began by serving this small dishes of food called banchan. Banchan are staple elements in every meal, these are side dishes of different kinds mostly vegetables which are meant to be shared. Some Banchan are refillable- kaya side dish palang busog ka na! 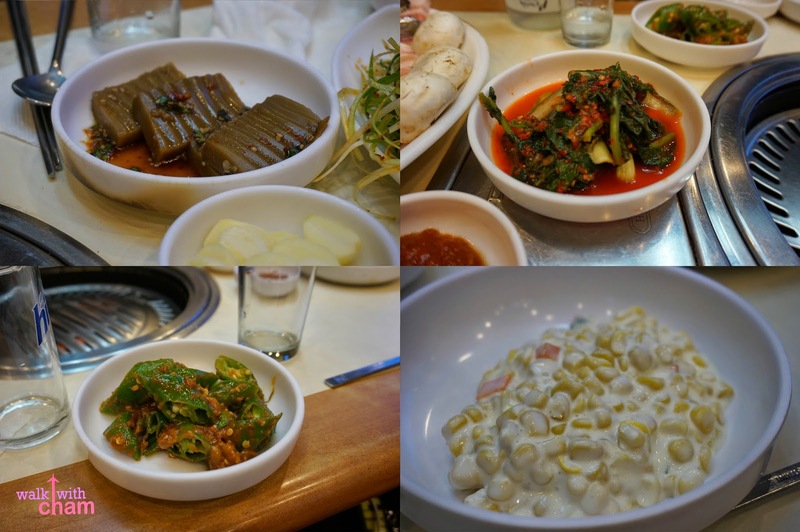 The most popular banchan is Kimchi, a traditional fermented Korean dish made of vegetables that is spicy & sour. 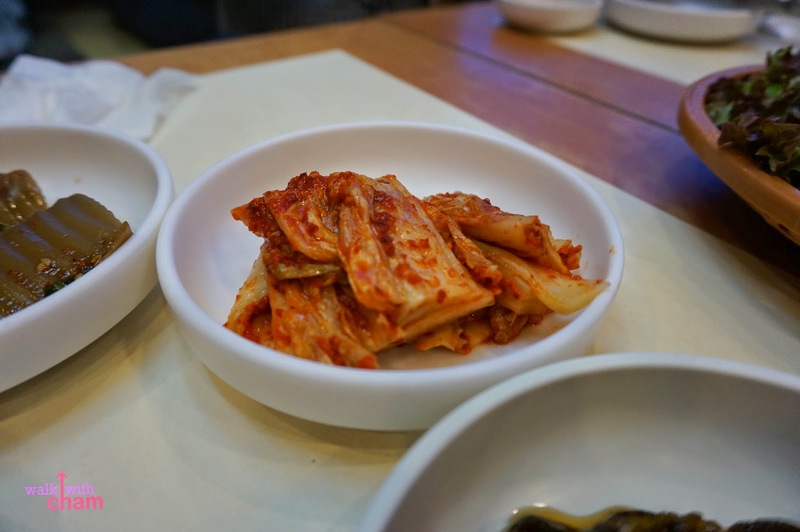 There are 200 types of Kimchi but the cabbage kimchi is the most popular. Their rice is served in a metal bowl that is said to be excellent and is comparable to Japan's gohan which is sticky and very tasty. And yes, they're actually right. 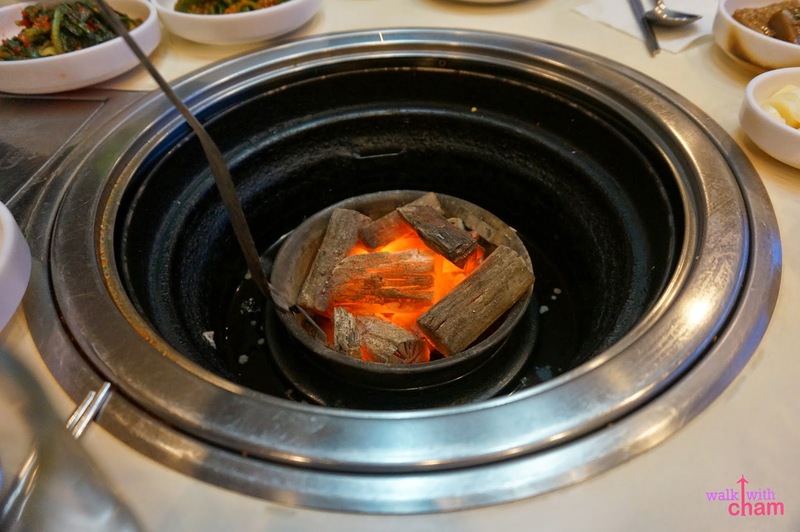 For the barbecue, this particular restaurant uses charcoal for grilling, it is said that the food is tastier when cooked this way. We ordered two types of meat: Samgyeopsal & Dawaeji Galbi. 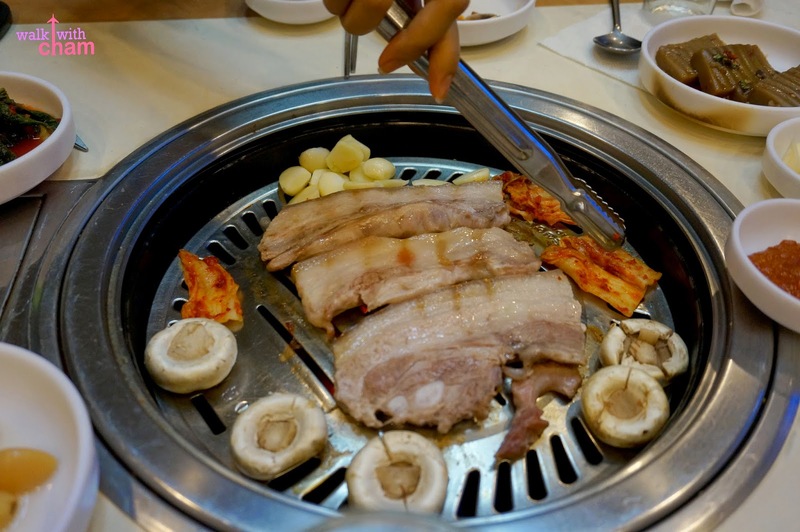 Samgyeopsal is one of the most popular Korean dishes. 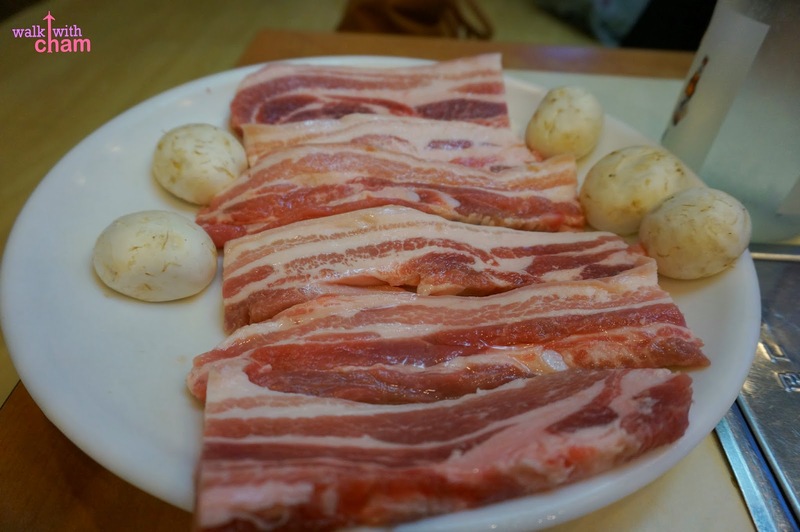 These are fatty slices of pork belly meat that are grilled by the diner's themselves. 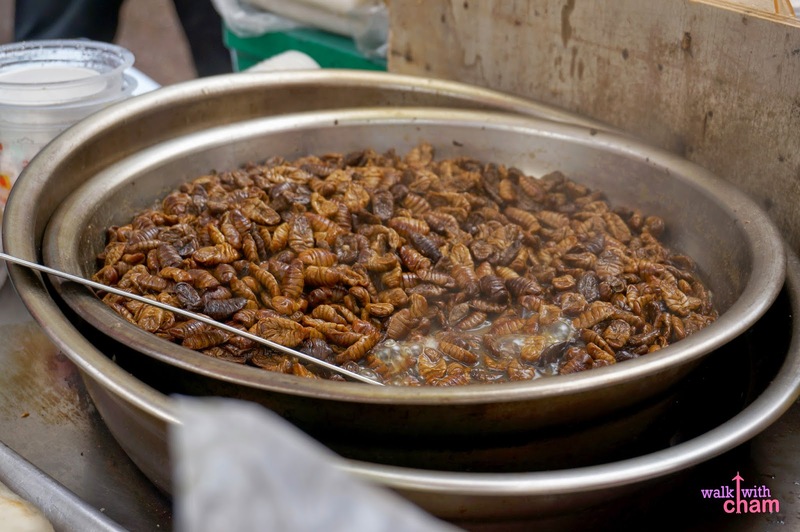 It is usually dipped in sesame seed oil mixed with salt and pepper. notice the white mushroom on the side? they're good too! 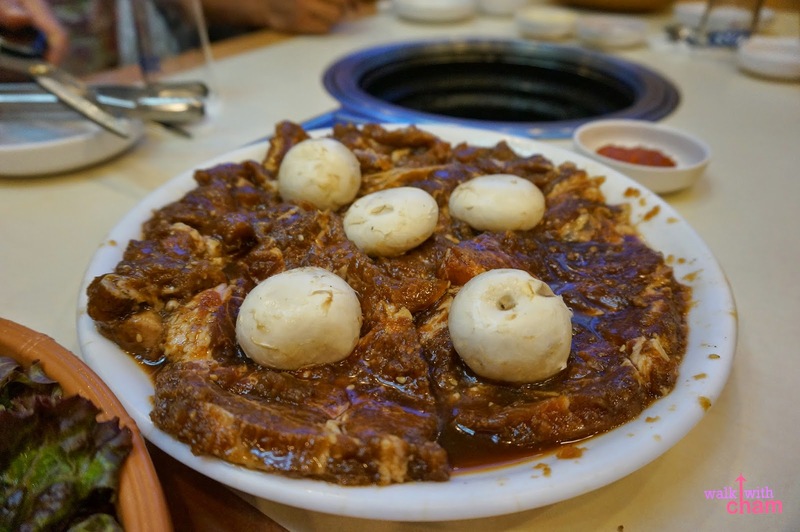 On the other hand, Dwaeji Galbi is a hot and spicy pork ribs, another popular dish in Korea. Alongside the barbecue a basket of refillable green leafy veggies are served. You can choose to eat the barbecue straight off the grill. Or you can wrap the meat with rice, veggies and sauces with the lettuce then take a bite. I enjoyed doing the wrapping but enjoyed eating it even more. 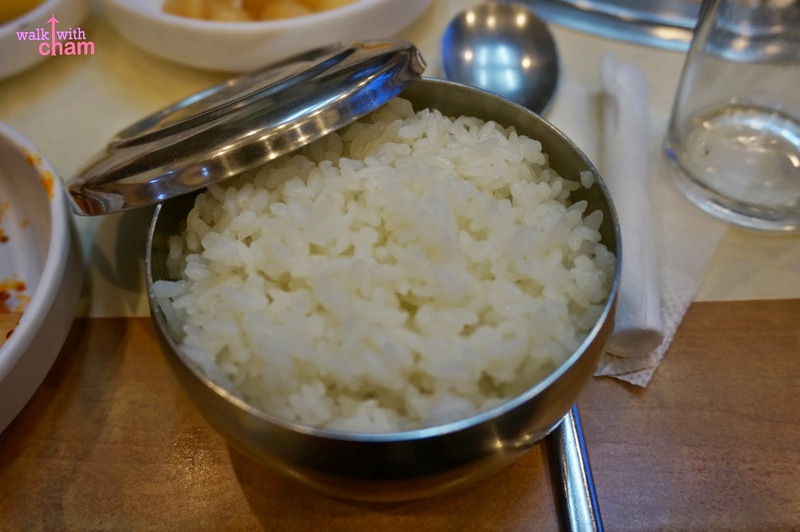 A signature Korean dish which means "mixed rice". It is served in a bowl that consists of rice, sautéed and seasoned veggies, chili pepper paste, soy sauce and topped with sunny side up egg. 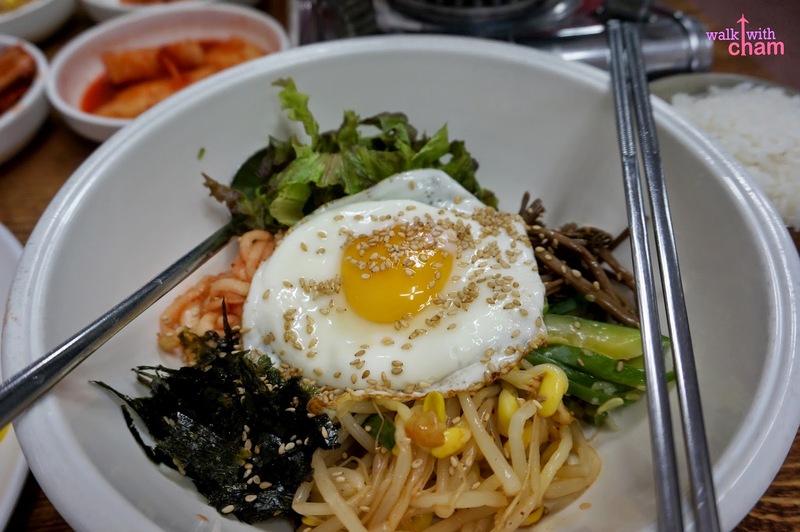 A variation of Bimbimbap is what they call Dolsot Bimbimbap. 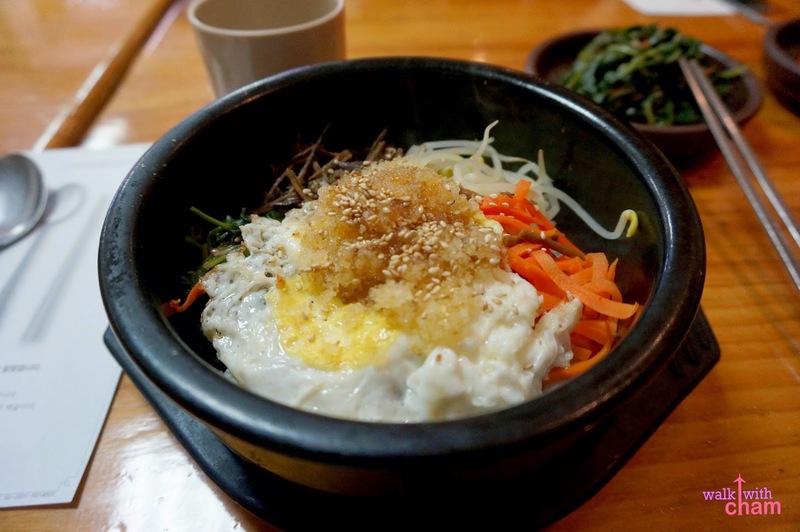 Here the Bimbimbap is served in a very hot stone bowl. I ordered this at a local restaurant in Insadong and believe me I like this type of Bimbimbap more. My friend on the other hand ordered Galbi Tang. 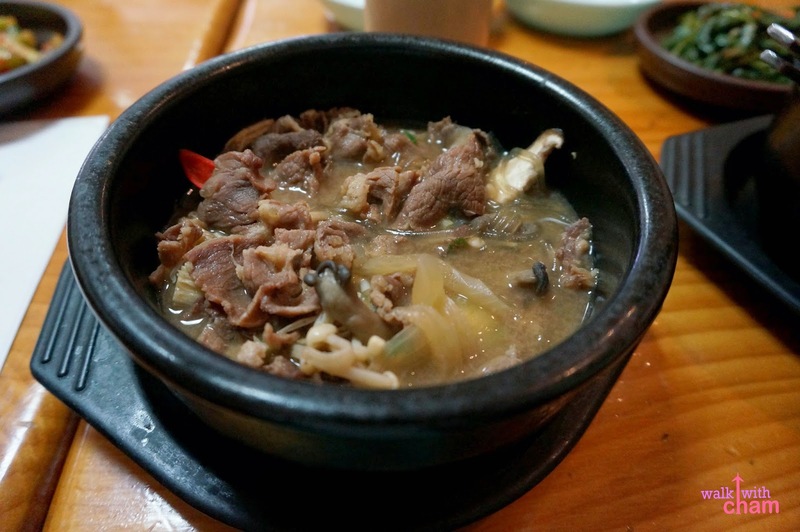 It is a kind of Korean soup made from beef short ribs. A simple clear hearty soup. 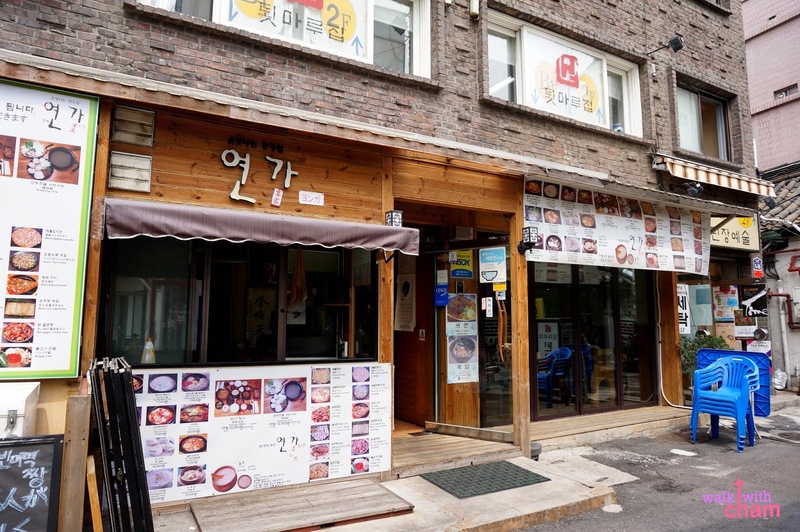 If you're in Insadong try to visit this restaurant called Yeon Ga, I really love their Dolsot Bimbimbap. 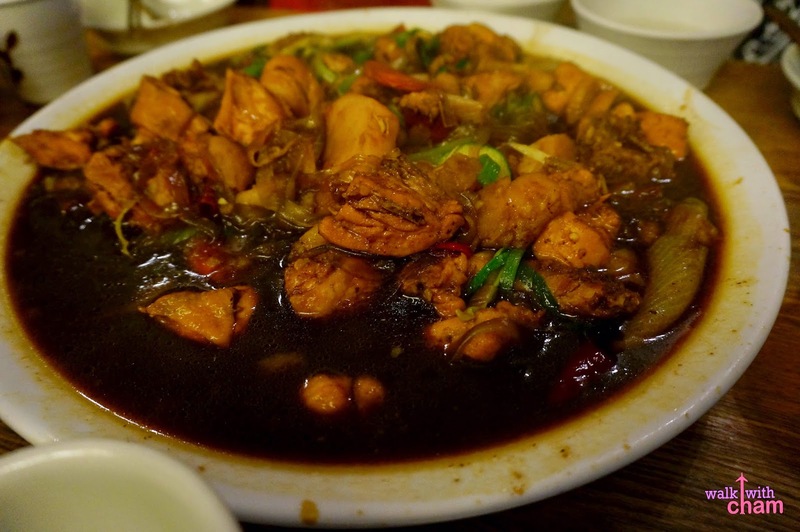 A stew-like Korean traditional dish made with soybean paste and a mixture of veggies, seafood or tofu. 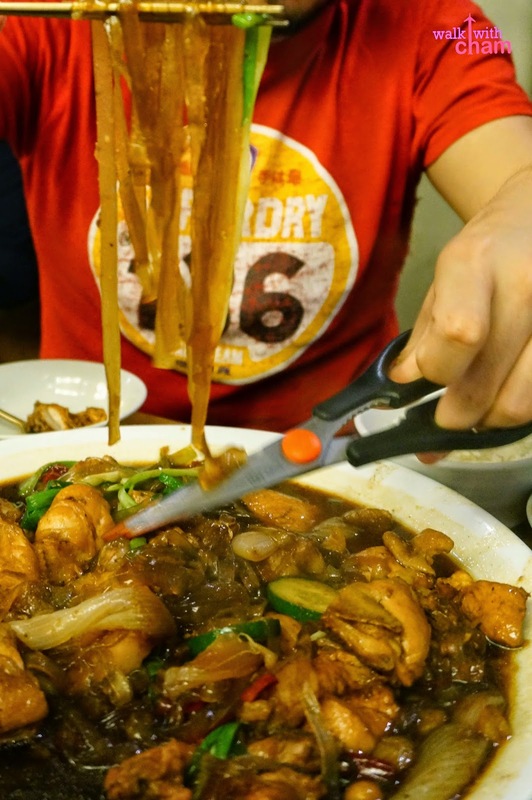 This particular dish is served with scissors to cut the loooong noodles. 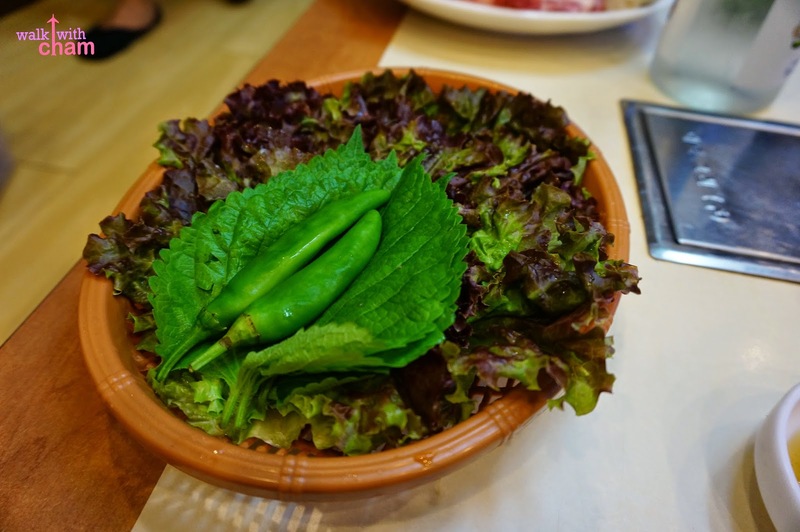 So if you're in South Korea and is craving for something distinctly Filipino, try this one. During our last night in Seoul, a Korean local recommended us to eat at a restaurant which best serve a Korean delicacy called Budae jjigae. 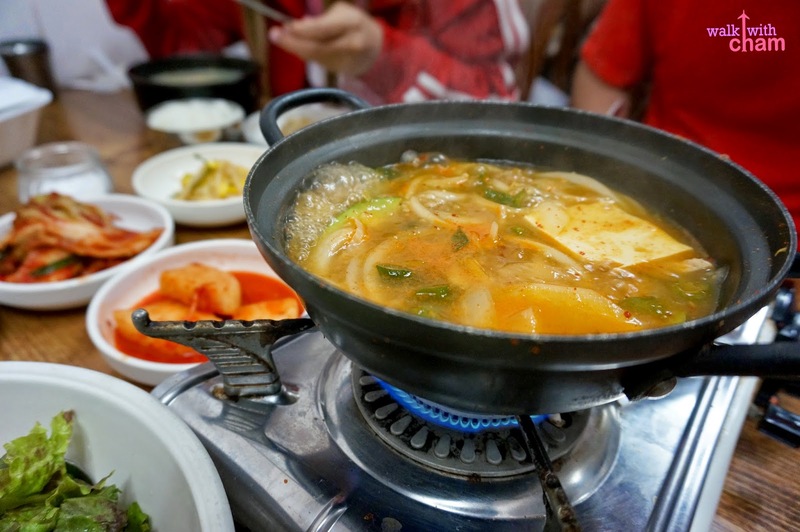 Literally called army stew, Budae jjigae is a thick Korean soup that uses Western ingredients such as hotdogs, spam or ham. 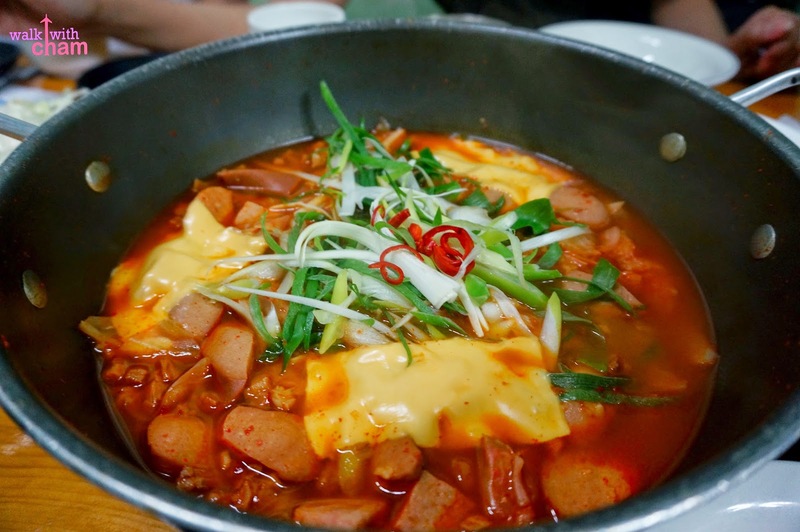 It is mixed with a traditional spicy soup flavored with red chili paste and kimchi topped with melting cheese. The fusion dish is unique & really delish! 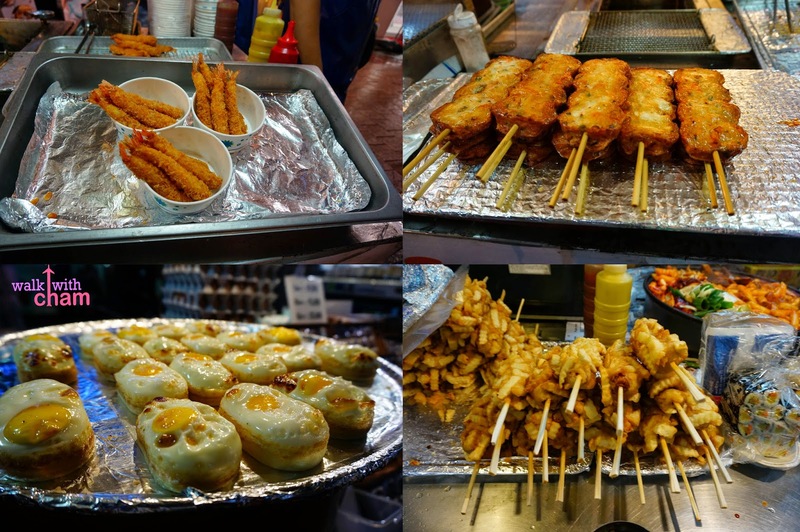 Aside from Andong jjimdak, Myeong Dong is popular for its endless options of (chanchararan) street foods! 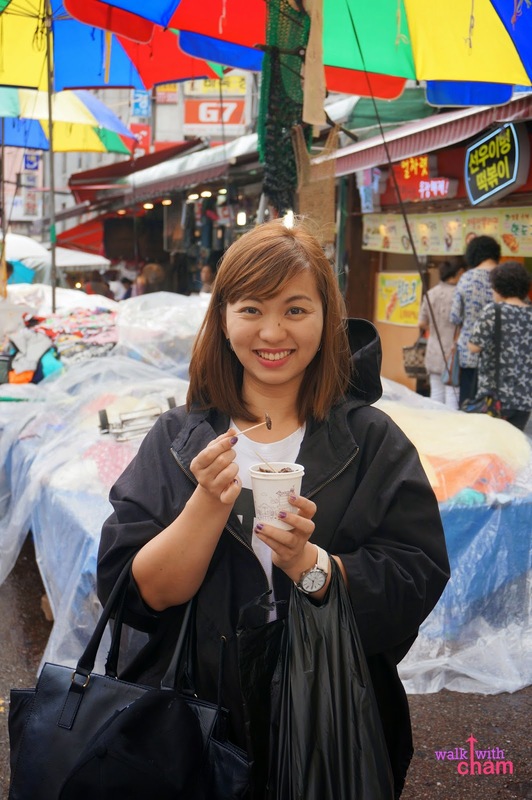 I enjoy eating street foods so Myeong Dong was heaven for me. It was pouring hard when we went there but the food didn't disappoint. 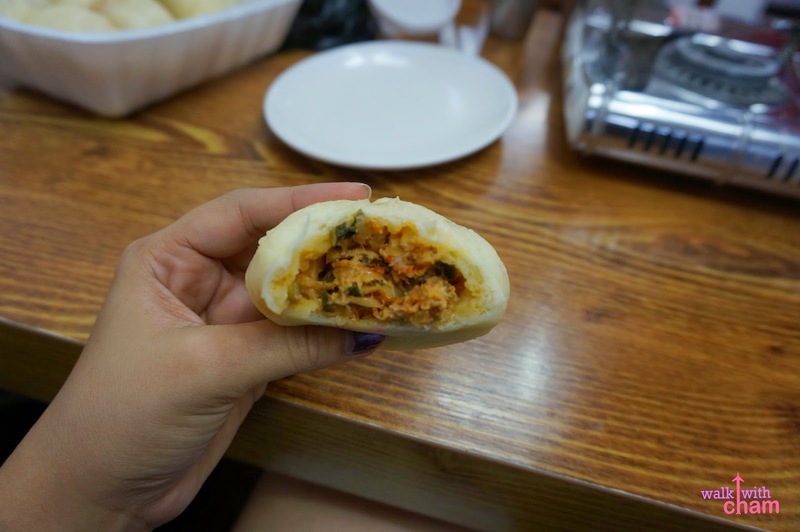 Another popular Korean snack is Wang Mandu, a Korean dumpling. 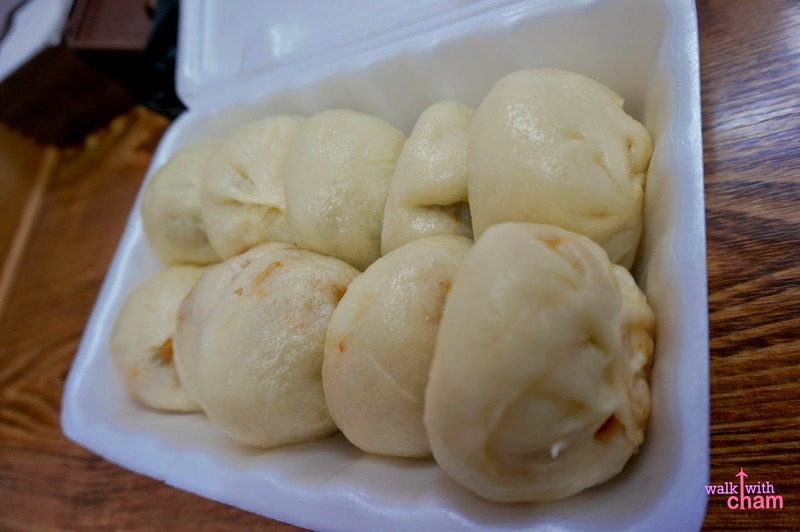 At first I really though it was siopao so I wasn't really interested in eating it (I'm not a big fan of that Pinoy snack) but I had a change of heart when I had a sample bite. 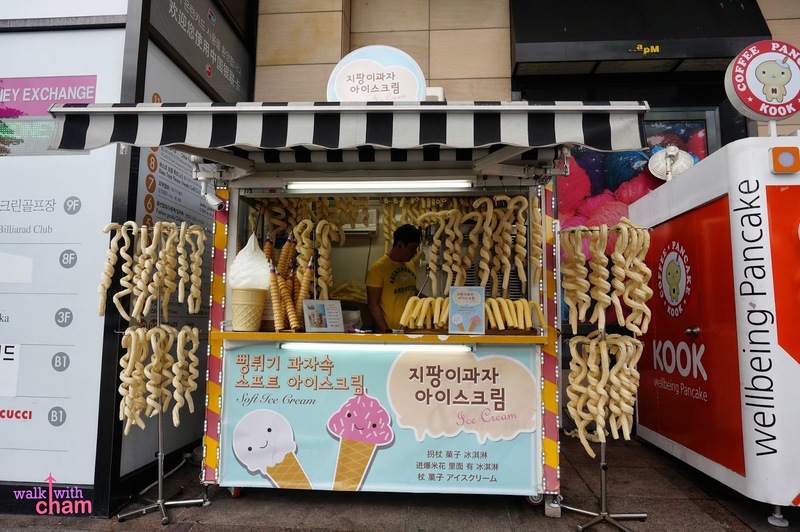 You can see Korean Ice Cream scattered anywhere on the streets of Seoul (I saw for about 4 of these in different areas in the city). The uniquely shaped ice cream cone is what sets apart from other ice creams I tried. Although the taste is nothing to rave about, you will be engrossed by how unique it looked. 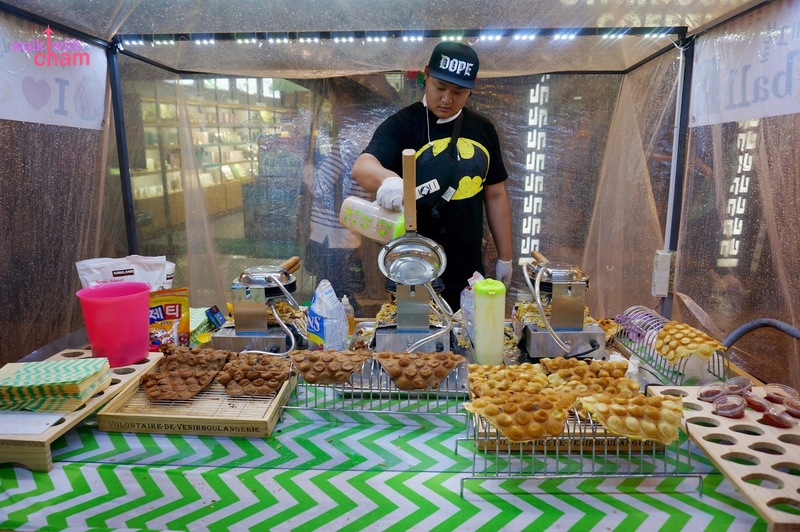 The cylindrical stick is made of corn and the soft ice cream flavor usually is vanilla.